After first bringing his mutinous troops into line by executing the ringleaders, Hamilcar was ready to make his presence felt. After a first attack on an island close to Drepana was easily rebuffed, he wisely switched to softer targets with which to boast his own prestige and his troops’ morale. He launched a naval raid on the southern toe of the Italian peninsula, where there were no Roman forces. But Hamilcar Barca’s real genius lay not on the battlefield, where he appears to have been a proficient but not exceptional tactician, but in knowing how to generate an appropriate public image for himself. Faced with the overwhelming military superiority of the enemy, a hit-and-run strategy was to some extent forced upon him, but that strategy nevertheless suited a man who appears to have appreciated profoundly the symbolic capital which could accrue through a series of eye-catching, if strategically pointless, raids. On the way back from the successful but ineffectual Italian expedition, he seized the height of Heircte, which most scholars now think was the mountain range centred around Monte Castellacio to the west of the Roman-held city of Panormus. From this easily defended point, which had access to fresh water, pasturage and the sea, Hamilcar planned a series of lightning strikes against enemy-held territory. His initial raid on the Italian mainland delivered morale-boosting booty and prisoners; thereafter things settled down to a ‘cat-andmouse’ war of attrition with the local Roman forces. By launching swift raids from his mountain refuge, Hamilcar was able to disrupt Roman supply lines and tie down a large number of Roman soldiers who could have been well used elsewhere. However, this strategy also tied down much-needed Carthaginian troops too. Thus, under Hamilcar, the Carthaginians came no closer to re-establishing their control of their old possessions on the island, let alone capturing new territory. Recognizing this, Hamilcar withdrew from Heircte in 244 BC and planned an even bolder venture: the recapture of Eryx. Sailing in under the cover of night, Hamilcar led his army up to the town and massacred the Roman garrison there. The civilian population was deported to nearby Drepana, one of Carthage’s last outposts, but curiously Hamilcar seems to have made no initial attempt to capture a further Roman garrison stationed on the summit of Mount Eryx. The town, which lay just inland from Drepana, certainly had strategic advantages, for, at over 600 metres, it provided an incomparable view over the coastal plain and the sea. Yet taking it was a odd choice, since it left Hamilcar and his force perched halfway up a mountainside between Roman forces at the top and at Panormus. The one route to his anchorage, following a narrow twisting path, only added to his problems. In terms of military strategy, Eryx would prove as fruitless as the heights of Heircte had done. Although Hamilcar continually harried the Roman forces who were besieging Drepana, his own side suffered as many losses as his opponents. Once again Hamilcar’s military strategy yielded a high profile for the dashing leader, but mixed results. At one point he was even forced to ask his Roman opposite number for a truce so that he could bury his dead. This was followed by a thousand-strong group of Gallic mercenaries in his army, fed up with the unrewarding war of attrition in which they were involved, attempting to betray Eryx and the Carthaginian army to the Romans. What Eryx lacked in strategic advantage, however, it more than made up for with its strong association with those halcyon days when the Carthaginians had been the dominant force on the island, rather than a defeated contender desperately clinging on to its last few enclaves. What could be better for the burgeoning reputation of a young ambitious general than seizing back a town which the Carthaginians had held for so long and in which they had such emotional investment? Eryx was the holy site where the goddess Astarte had for centuries held sway under the protection of her divine companion Melqart. In fact matters were soon taken out of Hamilcar’s hands. In Rome, it had been decided that the only way of breaking the deadlock was to rebuild the fleet. As treasury funds were low, much of the money for this ship-construction programme had to be borrowed from private individuals. The result was a fleet of 200 quinqueremes modelled on the superior design of Hannibal the Rhodian’s ship. In a conscious attempt to create a confrontation, the blockade of Lilybaeum and Drepana was tightened, thereby forcing the Carthaginians to act. It took the Carthaginians nine months to assemble a fleet of 250 ships. Although they outnumbered the Romans, the ships were poorly prepared and the crews lacked training. Furthermore, the admiral, Hanno, hardly had a distinguished record against the Romans, having presided over previous defeats at Acragas and Ecnomus. The plan was to drop off supplies for the army in Sicily before taking on troops to serve as marines. In 241 the fleet crossed over to the Aegates Islands, just to the west of Sicily, and waited for a favourable wind to carry them to Sicily itself. But the Roman fleet, already aware of their location, caught up with the Carthaginians as they were preparing to cross. For the first time, the Roman fleet had no need of the corvi, as it was superior in all areas of seamanship and naval warfare. The Carthaginian crews–poorly trained, with too few marines, and burdened down with supplies– stood no chance. The Romans sank 50 Carthaginian ships and captured 70 before the remainder managed to escape. The disaster broke the Carthaginians’ resolve, and they sued for peace. The terms agreed in 241 were harsh, but not unexpected. The Carthaginians were to evacuate the whole of Sicily, to free all Roman prisoners of war, and to pay a ransom for their own. Lilybaeum, which had held out to the bitter end, was surrendered to the Romans. A huge indemnity of 2,200 talents was to be paid to Rome over a period of twenty years. Lastly, neither Carthage nor Rome was to interfere in the affairs of the other’s allies nor recruit soldiers nor raise money for public buildings on the other’s territory. When the treaty was put before the Roman Popular Assembly to be ratified, the terms were made even stiffer. The indemnity was raised to 3,200 talents, with 1,000 due immediately and the remainder within ten years. Carthage was also to evacuate all the islands between Sicily and North Africa, but was allowed to hold on to Sardinia. Faced with ruin if the war continued, the Carthaginians had little option but to accept. There is, however, compelling evidence that the Carthaginians had begun to prepare for a future without Sicily. One of the reasons for the lack of resources to pursue the conflict against Rome in the latter stages of the war was that, astonishingly, the Carthaginians were concurrently fighting another war–against the Numidians in North Africa, and a great deal more successfully than the Sicilian campaign. Sometime in the 240s the Carthaginian general Hanno ‘the Great’ conquered the important Numidian town of Hecatompylon (modern Tebessa), which lay some 260 kilometres south-west of Carthage.50 Dexter Hoyos has suggested that the capture of Hecatompylus was part of a broader campaign of territorial acquisition marshalled by Hanno, which also included the subjugation of another significant Numidian town, Sicca, approximately 160 kilometres to the south-west. Was this part of a deliberate change of policy on the part of the Carthaginian ruling elite, and was it a reflection of the victory of those who wished to concentrate on Africa over those who wished to maintain the hold in Sicily? Certainly there were interesting changes in the Carthaginian rural economy. In the third century BC the hinterland of Carthage experienced a dramatic increase both in population and in levels of agricultural production. As a result of an archaeological survey, Joseph Greene has argued that this was the result of dispossessed Punic farmers leaving Sicily and Sardinia and settling in North Africa, but there is reason to think that this reorganization of Carthage’s rural territory was part of the same process as the military action against the Numidians, for it seems that some members of the Carthaginian elite had finally decided that there were easier ways to prosper than the retention of the western Sicilian ports. Trade between many of the Sicilian cities appears to have all but ceased. Local wine and agricultural products, which had previously dominated the market, were replaced by imports from Campania as Rome took control; but, even so, large numbers of amphorae from Carthage simultaneously start appearing in the archaeological record. It seems that the Carthaginians were now exporting large amounts of their own agricultural surplus to Sicily, so it was paradoxically its loss that finally created the circumstances under which Carthage could profit less problematically from the island. Apart from a brief interlude of three years during the Second Punic War, Carthage would never regain a foothold on Sicily. The Carthaginians had been defeated by an enemy who had simply refused to play by the rules of engagement which had for so long held sway on the island. The destructive march of the Sicilian wars had continued for the best part of 130 years, but it had always been punctuated by intermittent periods of peace which allowed both Carthaginians and Syracusans to regroup. However, Rome, with its extraordinary ability quickly to integrate the human and material resources of those whom it had subjugated, had proved to be a very different proposition. Such had been its ability to sustain a war effort for decades, and at a high tempo without any respite, that it had been able to exhaust the stamina of Carthage, one of the best-resourced states of the ancient Mediterranean. Moreover, after the first year of the war any chance that the Romans might have accepted some kind of territorial division of Sicily had completely disappeared. The Syracusans, who had been relatively content to maintain a strategic stand-off, had now been replaced by an uncompromising, expansionist enemy who demanded nothing less than the total retreat of the Carthaginians from the island. The latter, despite their initial advantage particularly in terms of sea power, had simply been unable to adapt to this new challenge. Sicily was proverbial with mercenary service. The preconditions of tyranny, internecine warfare, and coinage all flourished on the island from the late archaic age. The tyrants of Syracuse attracted Peloponnesians into their service from at least the early fifth century. Dionysius I established diplomatic links with Sparta for this purpose and was one of the principal employers of mercenaries, not just Greeks, in the early fourth century. A series of wars against Carthage led to a boom in mercenary service on the island. Later tyrants of Hellenistic Sicily also hired mercenaries in great numbers, as much in response to Carthaginian hostility as for their own personal protection, and many came from the Greek mainland. Agathocles initially armed the poor of Syracuse for his own purposes (Diod. 19.5–9) and then in 316 hired a largely mercenary army to fight Carthage (Diod. 19.72.2). A generation later, Hieron recruited mercenaries for his own security (Polyb. 1.9.6). In addition to Greeks, these tyrants employed Celts and Italians. Just after Agathocles’s death circa 289, a large group of Campanians proved particularly troublesome in returning to Italy from Syracuse when they seized the city of Messana and became a permanent thorn in the side of their neighbors (see Diod. 21.18 and 22.7.4; Polyb. 1.7.2–8; Plut. Pyrrh. 23–24). They styled themselves the “Mamertini” after an Italian war god, Mamers. Their success burgeoned along with their numbers and ultimately they caused the first war between Carthage and Rome. As Roman allies they survived the Punic Wars and prospered. These mercenaries illustrate that the transition from renegade wanderer to established city dweller, though violent in its process, did happen (Griffith 1935: 194–207). The Carthaginians had long held interests in Sicily and other western islands. Ancient sources, written by their enemies, principally the Romans or Greeks with Roman affiliations, stress the reliance Carthage had on mercenaries. Polybius (6.52.2) regularly implies that mercenaries made up Carthaginian armies. Griffith (1935: 225 n. 1) states “the Carthaginian armies were very like mercenary armies in practice, even if they were not actually mercenaries.” The heart of most Carthaginian armies, along with the officers, remained Carthaginian, and like the Greek cities, Carthaginians served in a citizen militia when necessary. But Roman prejudices tainted the Carthaginians as hucksters and traders rather than as land-holding farmer-soldiers using their wealth to buy fighters for their protection. The language of the pro-Roman sources often paints most Carthaginian soldiers as mercenaries (not subject allies). Roman auxiliaries fought under compulsion as much as for love of Rome, but are styled as allies (socii, auxilia). During the Second Punic War, for example, Livy (29.4.2) notes that Carthaginians hired (conducere) African auxiliaries (Afrorum auxilia), and he calls the African soldiers mercenaries (28.44.5, 29.3.13). In Spain also the Carthaginians hired Spaniards (Livy 23.13.8) and Livy (23.29.4, 24.49.7) notes specifically Spanish and Celtiberian mercenaries. But in both Africa and Spain Livy (24.42.6; cf. Polyb. 10.35.6) notes the existence of a levy (dilectus). Hannibal calls his Spaniards allies (Livy, 21.11.13, 21.3). These Roman references to Africans and Spaniards cover the range of relationships from mercenary to ally and no doubt the reality was more complex. Carthaginian forces may have been like mercenary armies, but so were the armies of the Hellenistic monarchs. Carthaginian armies with their Hellenistic style and elaborate makeup of men from all over the Mediterranean must have presented a varied image to Roman adversaries. Carthage drew its armies from the many peoples in the western Mediterranean: local Libyans and Numidians, Gauls, Baleares and Celtiberians, while Sicilians, Etruscans and other Italians, Greeks and Macedonians and Indians were to be found too. 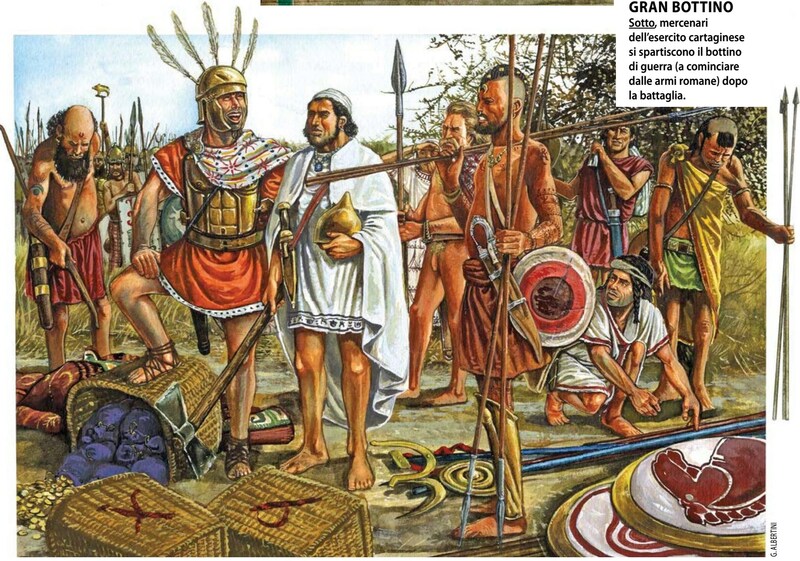 The army which Hannibal led into Italy included the full array of Mediterranean peoples (Polyb. 11.19.3). Small wonder Romans saw this diversity as mercenary service in action. The image of Carthaginian armies was not helped at the end of the First Punic War when their mercenaries, recently returned from Sicily without pay, revolted. Thus Carthage paid the price for its dependence on professionals. The Truceless War supposedly unparalleled in atrocity brought Carthage close to destruction (Polyb. 1.73; Diod. 25.3). The mercenaries fought for three years in Africa, until the genius of Hamilcar Barca, the resolve of the Carthaginian Republic, and the divisions of the rebels finally saw Carthage victorious. The war reveals that Libyans made up the majority of the “mercenaries” of Carthage, but all manner of men served, including Greeks from different regions (Polyb. 1.67.7; Diod. 25.2). The number of Libyans suggests a less mercenary and more subject-ally status of these men, and certainly the Libyan subjects of the Carthaginians contributed both men (Polyb. 1.70.8) and money (Polyb. 1.72.5) to the revolt. This entry was posted in Ancient Warfare, Wars by MSW. Bookmark the permalink.